Happy New Year to all my followers and in a year when I officially “retired” as a professional wildlife photographer after twenty years, I have never been as busy. 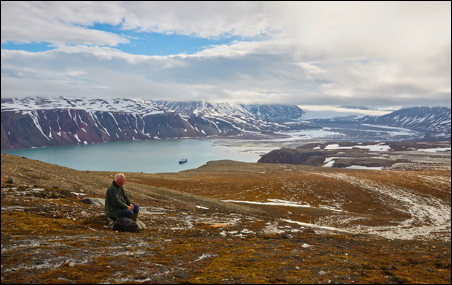 This weeks photo of me in Spitsbergen, less than six hundred miles from the North Pole, was taken by an official photographer from Oceanwide Expeditions to illustrate the wildness of their cruises. I just happened to get in the way and had no idea I was being photographed! The cruise ship Plancius is in the fiord way below where I am sat. This photo is now on their web-site as a sales tool! The year started off with my monitoring up to five Long Eared Owls in a winter roost. These gave me great enjoyment and many photos although most of the time the Owls had their eyes closed! My 70th Birthday was spent in Iceland in March and we had all the snow that I wanted and some good seafood but no Aurora. Out of the blue in June I was on my way to Spitsbergen to look for Polar Bears and Ivory Gulls. I have always wanted photos of a Polar Bear with prey surrounded by Ivory Gulls. Not only did I manage this but I also came across a female Polar Bear with three cubs which is almost unheard of in Spitsbergen. On Islay in June I finally managed to film a Hen Harrier food-pass. In July I visited Speyside to film Ospreys catching fish and in the same month managed to take some high-speed shots of Kingfishers in flight something I have been after for a long time. In October I was back on Islay for the Geese and the year finished perfectly with the arrival of my favourite bird the Waxwing – hundreds of them!! Perhaps 2017 will be more restful?